It's a winter wonderland in Northeastern PA. It was a perfect, beautiful Sunday for a hike to the Pinnacle, touted as one of Pennsylvania's greatest vistas. AT thru-hikers have remarked it's one of the prettiest views in the state, and I'm beginning to agree with them! We did the hike as a group this past August, but visibility was so awful from a thunderstorm rolling in that we didn't get to see more then three feet in front of us when we got to the vista. I told other TerraMar guide on the hike with me that I didn't believe there was any vista at all! But I was definitely proven wrong this time. We left Philadelphia at 7:30am and were out on the trail by 10 in a group of 16. It was in the mid-30s in the morning and snowing, but midday the snow let up and the sun came out. We all had trouble finding room for extra layers in our backpacks when it warmed up. I was comfortable hiking in a base layer with my rain coat and rain pants on, despite having brought my down jacket and assuming I'd need it. The trail begins with a gentle incline, then rises sharply a mile in. After another mile and a half of climbing, we reached Pulpit Rock, pictured at the left. It was beautiful, and also marked the end of the really hard part of the hike! The trail was pretty well packed down up to that point with obvious steps up to Pulpit Rock. No one wore crampons or used trekking poles, and we rarely punched through the snow. It was great! Pulpit Rock is a turnaround point for some hikers, and others proceed another mile toward the Pinnacle and bail out on a red-blazed trail. The trail between Pulpit Rock and the Pinnacle wasn't as well stomped down, but we still had no trouble navigating. Perfect, beautiful vistas from the Pinnacle. We reached the Pinnacle just after 1pm and the view was certainly worth the trip! It dispelled any doubts I had about its existence. The snow still fell a bit, but the sun was weaving in and out of the clouds, casting shadows on the hills around us and the landscape below. It was beautiful. We stopped for a snack break and photos, then proceeded down an abandoned fire road back to the parking lot. We met a group of snowmobilers on the way, and I was thankful they'd packed down the snow for us. We arrived back at the cars just after 2pm, which is the fastest I've ever hiked that trail with TerraMar. A group of us were anxious to make it back home to watch the Canada vs. US Olympic gold medal hockey game. I walked in the door just as the second period started, and spent the afternoon watching the game while my boyfriend, who's Canadian, bantered back and forth with American friends on the phone. It was a perfect day for a hike, and a great, enthusiastic group of TerraMar folks. We're doing the Pinnacle/Pulpit hike again in April, but the next hike we've got coming up is one of my all-time favorites - Mount Tammany Hike and Pie! 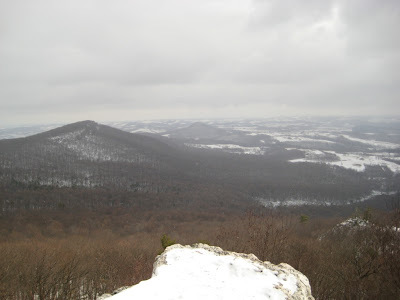 Have you done local hikes in multiple seasons? 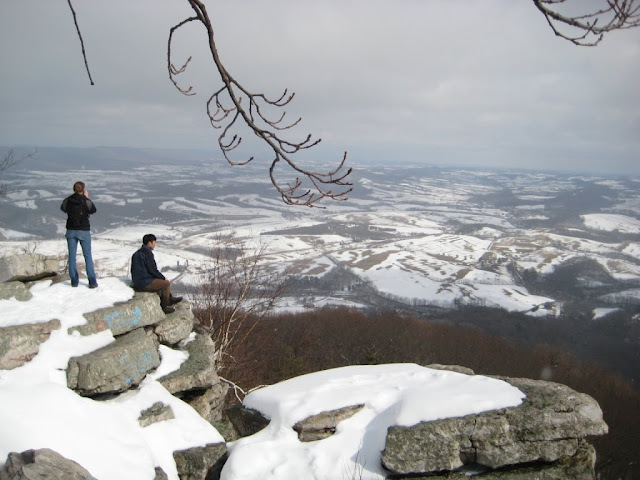 What are some of your favorite winter hikes near you?